Professor Davis is an expert in chemical process design and optimization - the study of how to build good chemical plants. He has published on identifying performance limits for networks of batch-wise (time-dependent) chemical reactors and on modeling and assessing the sustainability of corporations. His research work is currently focused on sustainability assessment, sustainable process design (the economic, environmental, and social impacts of chemical plants), bioprocess design, and operations research. He teaches three required courses for chemical engineering undergraduate students: process simulation and mathematical techniques, separation process principles, and process evaluation and design II. 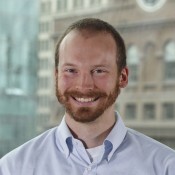 Based on his research experience, he has offered elective courses on advanced chemical reaction engineering, convex optimization techniques, and sustainability and pollution prevention. Professor Davis has been an active member of the American Institute of Chemical Engineers (AIChE) since 2004 and has given many presentations at their Annual Meetings. He has been a member of the Education Division of AIChE since it began and will serve as the Secretary / Treasurer of the division from 2011 until 2013. Professor Davis served as a teaching fellow through the National Science Foundation GK-12 program in 2008-09, working with two 8th grade physical science teachers two days a week giving lessons, helping to design demonstrations and experiments, and generally being a "science and engineering expert" in the classroom. His experience in the GK-12 program inspired him to continue his active involvement in K-12 education, creating lessons and working with teachers in local high schools in New York City to help educate students on the purposes and activities of engineers. Professor Davis has been at Cooper Union since his graduation from UCLA in 2009 with his Ph.D. in Chemical and Biomolecular Engineering. He is originally from Grand Island, NY and received his B.S. in Chemical and Biomolecular Engineering from Cornell University. His hobbies include travel, fantasy baseball, and ultimate frisbee. See Benjamin J. Davis's full CV.